Long time ago, I was in a bad mood, a bad shape and needed to change my mind. Get away, see something else, get this feeling of freedom when running in the nature. 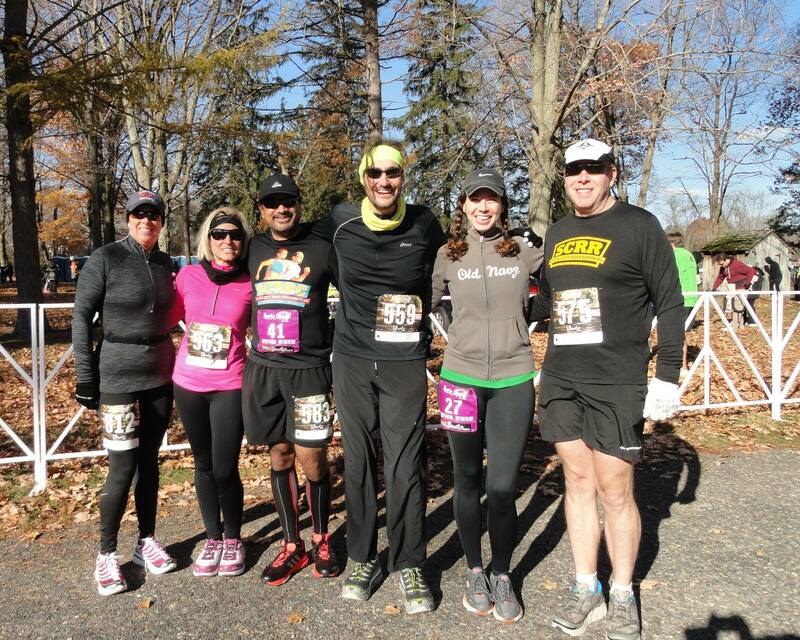 Several friends reported that the Bucks County marathon was fantastic. The marathon takes place during a week-end on Sunday. There is also a half-marathon on Saturday and you can sign up for both with a discount. I signed up for both events (Half-Marathon and Marathon) early on March, 23 2014 for $120. This is quite on the expensive side (the Rock the Canyon that combines two similar races is priced at $110 but has clearly better perks, I will come back later on that). It turned out that in the meantime, I signed up for a 50 milers the week end after. The strategy was then to consider this race as a last training run, an endurance effort were I can see how my body can run 39.3 miles over two days. Might be a good evaluation of my fitness level before pushing it for 50 miles in a single day. If you run both race (what is called the “Bucky” challenge), it is recommended to pick up the packet early on Friday night. This is what I did but I also took the packet for a friend that signed up lately a week before the race. It turned out that his registration was missing. For the price he paid ($180 for late registration), this is clearly a mistake from the race organizer. Once you take your packet, you get a confirmation on your e-mail for your race number. Unfortunately, my girlfriend has a wrong number e-mailed to her. Over all the week end, nobody from the organization staff was able to provide a firm and definitive answer about how to fix this issue. That sounds really unfortunate and the registration management was clearly not handled properly. The race negotiated a discounted rate for the hotel: $109 for a room at the Element in Ewing. As I try to give my business to organization that support the race, I stayed in that place. That was definitively a neat decision: the room has a lot of space, the hot breakfast is served early enough so that you can take it before the race and they allow a late checkout at 3pm on marathon day. On top of that, the shower is fantastic (especially great after a nice race when you stayed in the cold for several hours). If you plan to run the race, this is definitively a nice place to stay. 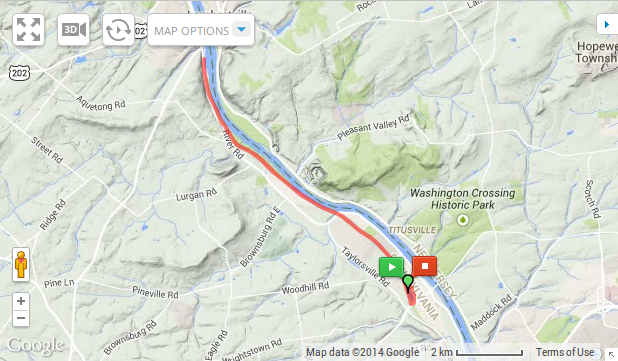 The Delaware Canal Half Marathon starts early at 10:00am. As the weather can be cold at that period, this is clearly a neat choice so that you start when temperatures are the best! Unfortunately, the race started lately because people were still trying to register. This was an opportunity to see a fellow runner, Beth, that ran the Rock the Canyon Challenge with us in July. Good to see fellow runners there! On the other hand, staying and waiting in the cold is not a wonderful experience but fortunately, this did not last too long. The starting line is next to the Canal. 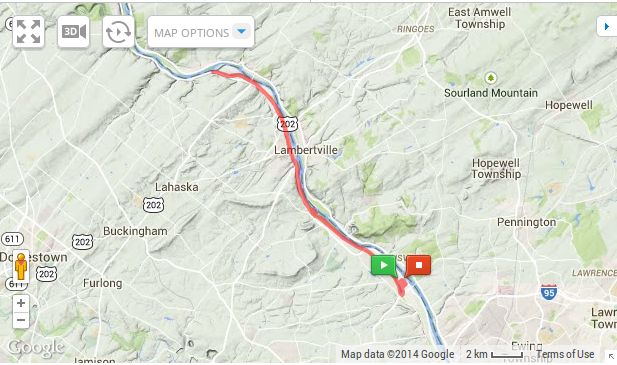 The route is an out and back on a graveled path and the elevation profile is non existent. Clearly an easy course if you plan to test your endurance. Starting Delaware Half Marathon SCRR style! 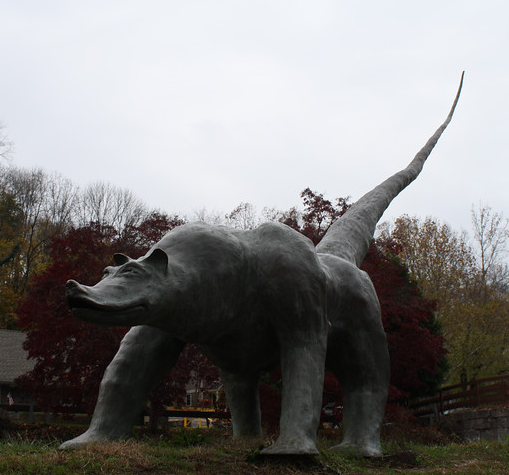 The route is scenic and go over a beautiful path. You will discover beautiful houses, ducks, bridges and so on. As shown below, the elevation profile is not an issue at all. During the race, water and gatorade are available quite often and as you pass twice at each one, you do not even need to carry a bottle of water. On the other hand, there is no nutrition but this is definitively not an issue at all for such a distance. If you feel you might need fuel during the run, consider taking a gel or any nutrition you can handle. Once you finish, you received a bottle-opener medal and can refuel with plenty of food available (burgers, pasta, chili, etc.). For the runalcoholic, no alcohol is permitted on the park so you will have to go somewhere else to celebrate with a beer! Once I crossed the finish line, I see Beth again. Even if she was considering to run the marathon the day after, she finally decided not to do so because of an injury. On our side, we tried to find out why my girlfriend got the wrong bib number assigned but no staff gave clear instructions. We came home with a picture of the bib, hoping that everything would be solved. The Bucks Country Marathon starts at 09:00am. The weather was less collaborative, a little cold but this is appropriate while running: after a couple of miles, your body is warm enough so that you do not feel any cold. Hopefully, the race started on time with several waves of runners. 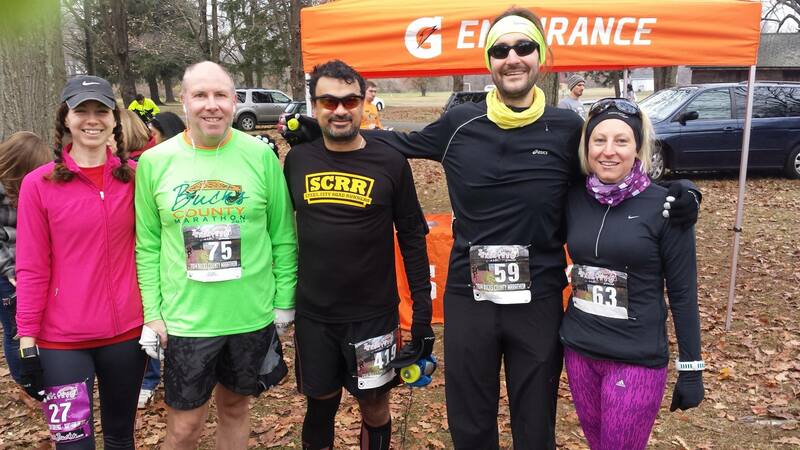 Start the Bucks County Marathon – SCRR style! The course follows the same route as the half-marathon but go further. Instead of turning and coming back after 6.5 miles, you make a turn after 13.1 miles. The elevation is still the same: not existent. As for the half-marathon, this is a great way to train your endurance, especially when doing both races: you can then evaluate your endurance on (about) 40 miles. If you are planning an ultra soon, this is definitively a good way to see where you stand in your training. If having no nutrition during a half-marathon is not a big deal, it can be a real problem for a longer distance such as a marathon. And at the Bucks County Marathon, the only nutrition available was a box of gel available at mile 8 and 16. The box was laying on the ground, several runners did not even saw it. This is definitively not appropriate at such a price and with so many runners. Again, this is clearly a mistake from the organization staff. Over the race, there are several portable toilets. Not a lot but enough for anyone if nature calls during the race. Again, as the route is an out and back, you have several opportunities to stop. Once you cross the finish line, you get a bottle opener medal, the same as the day before but with another logo. No variation with the previous medal. And no additional bling if you complete both races. 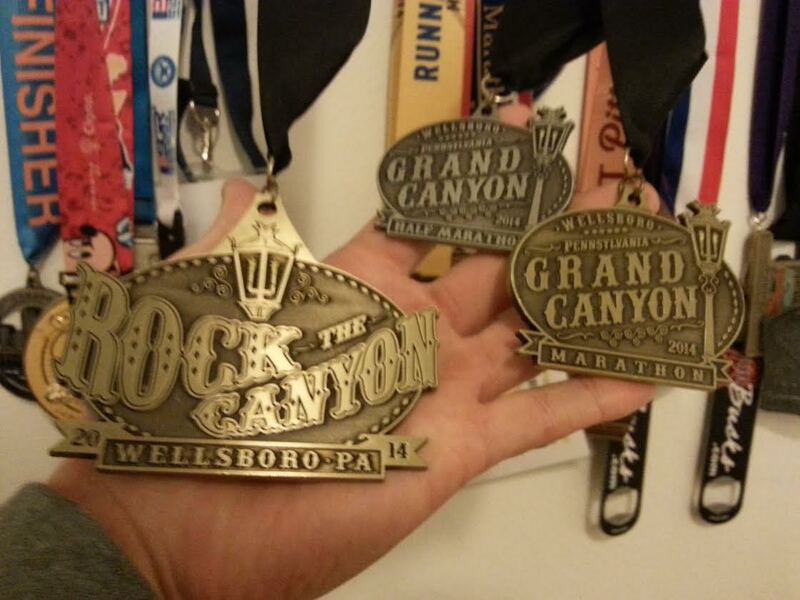 On the other hand, when completing both race at the Grand Canyon Marathon week-end, finishers got an additional medal as well. Here, nothing and even the staff was rude (see below). One of the benefits of doing the Bucky is potential additional perks. In fact, you are supposed to get a shirt or hoodie when you complete both races. Unfortunately, after crossing the finish line, nothing was there. I asked the volunteers if something was offered for people completing both races and the dude told me “There is nothing, congratulations Mr Bucky”. I really think this was not appropriate considering the lack of organization from the staff and that the race is on the pricey side. After the marathon, I asked somebody from the organization staff that told me the registration was not correctly handled and there were some mistakes. There were definitively a shirt or hoodie offered to runners completing both races (half marathon and marathon) but they were not available and would be sent by mail. However, after the race, there was no communication. No e-mail about the results, the pictures or even the fact that the registration for the bucky challenge have been screwed! The main communication media was facebook, but people should not have to use a social media platform to be informed the race. Obviously, in addition to the registration, the communication was clearly screwed as well. It totally depends on what are your objectives. If you are looking for a good training race, that might be a good idea, if you get the early bird rate ($120 for two races, still reasonable to train on a nice route). But the late rate ($180) is clearly too expensive for a training run. Sure, the route is nice, but considering the issues runners encountered, this race is overpriced. On the other hand, if you are looking for a nice supported race with a good support and people cheering, go somewhere else. Put more money (and maybe not if you get the early bird rate) and sign up for a nice marathon, such as Pittsburgh or Richmond (the same week-end by the way). At least, you will get a nice medal and a real support. I completely agree. Also to note, I emailed the director at rock the canyon to let them know I might not be able to run and they were completely willing to defer my entry and it was never an issue! They were so helpful, it made me want to run!!! Also, I wonder if someone else organized the Bucky last year because the medals were spectacular. I came back to run this because it was so nice last year…. This year, I was way too cold and that did not help my injury. I couldn’t feel my ankle for about three miles because it was wet! It was nice to see everyone, but let’s meet up at a less chilly race with better medals. I paid 90$ I think or 88$ for just the half. I was so cold I didn’t stay for the food!! !